Today I have a memoir book review for you! 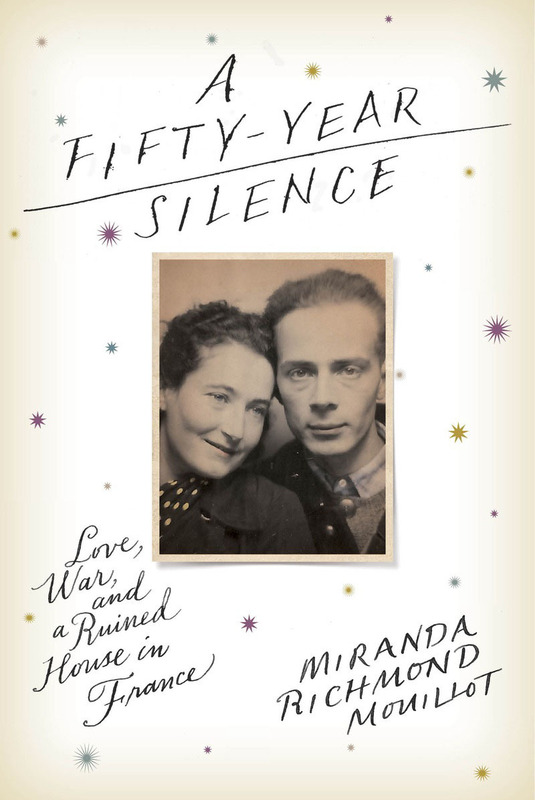 I love memoirs, so I was excited to request Miranda Richmond Mouillot’s A Fifty-Year Silence from Blogging for Books in exchange for my honest review. I love historical fiction and non-fiction… I always joke that World War II was my favorite war, but I think that’s simply how accessible it has been for much of my life. Both of my grandfathers as well as other relatives served in the war, and I was introduced to the war in elementary school through books like Number the Stars, Anne Frank’s Diary of a Young Girl, The Endless Steppe, and many, many others. So to find that this memoir deals with the life [and secrets] of the author’s grandparents during and after World War II was incredibly intriguing. And the beginning was fascinating! The author does a fabulous job of pulling the readers into her life and her grandparents’ stories. There’s something magical about Europe, and France in particular, and the author captures the place beautifully. As I read on though, my interest in the book fizzled out and I actually ended putting it down for a time. There just was so much speculation and not enough facts. I don’t want to spoil the ending for you, but while I appreciate the author’s book in that it memorializes her grandparents, her theories are just not compelling enough for me to believe. That does not in any way detract from what she does know–I’m just not sure I could come to the same conclusions about how and what they survived. This also does not detract from the way the author tells her love story, her life story. As a standalone story, her life/her love is pretty neat too. 🙂 Her grandparents’ lives are awesome too–her grandmother became a doctor during the middle of the 20th century in a time when many women didn’t even go to college. Her grandfather was an interpreter at the Nuremberg Trials in Germany after the war. Miranda Richmond Mouillot has a lovely writing style. I’m not sure if she plans to write other books, but her lyrical prose draws in readers like nothing else can… making a non-fiction story read like a classic, lovely novel. Again, the setting of the book in FRANCE definitely helps but still–her writing style and word choice is gorgeous. Instead of being on my couch in Nashville, I was in a medieval stone house in an a village older than time. Can it get any better? Ohhh, France. The biggest problem I had with the book aside from the lack of information was that, not to discount anyone’s survival from the Holocaust, her grandparents were not in concentration camps. They were not captured and didn’t seem to have many [any?] close calls either. They were Jewish. They had to flee, but they survived. And that’s incredible and I don’t want to discount their story or others like it. However, in some tiny ways, saying individuals like that survived the Holocaust is a shaky subject, and may even be one that I can’t take too hard of a stand against since I don’t have that first-person/familial experience. In some ways that discounts the stories of those who did survive concentration camps. It just, to me, softens those survival stories in some ways. I’m not sure of a better way to frame their experience besides “Holocaust survivors” but I just think there has to be some other category. I do understand the perspective of Mouillot on this though. Overall, I enjoyed reading the story of Mouillot and her grandparents–their stories of life and love and survival were incredible, passionate, and told beautifully. Reading about the animosity [to put it lightly] between her grandparents was hard. I can’t imagine not talking to Ben ever again like her grandparents did, or the effects that would have on our larger families. This book wasn’t exactly what I was expecting but it was lovely, even if hard to read at times and controversial in terminology too.